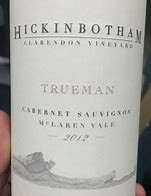 We had the opportunity recently to taste the 2015 releases of the Hickinbotham Clarendon Vineyard in McLaren Vale. The four wines reviewed here again showed very well just as they did in the 2014 vintage. They offer rich and concentrated aromas and flavors and good texture and mouth feel with firm but silky tannins, Compared to 2014, they reveal somewhat more of the vineyard signature, power and earthiness, outstanding balance and good length. Despite their big tannins, they are drinking well today (with decanting) and should provide drinking pleasure for a decade or longer. Hickinbotham Clarendon Vineyard is one Australia’s most beautiful and iconic vineyards. 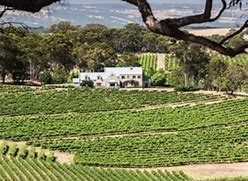 It was established by Alan Hickinbotham in 1971 in McLaren Vale, and over the years has been the source of fruit for some of Australia’s finest wines including Penfolds Grange and Hardy’s Eileen Hardy. Jackson Family Wines purchased Hickinbotham in 2012. After its purchase of this historic, 200 acre property, Jackson Family Wines launched a major revitalization of the vineyard that included reducing yields (Merlot) and improving pruning and canopy management. In 2015, the team began to see the benefits of their revitalization initiatives, which included removal of diseased vines, new irrigation infrastructure, and more balanced crop load management. The grapes for the Hickinbotham wines are handpicked, destemmed, sorted and transferred to open fermenters. After a four-day cold soak, the wines are pumped over daily and kept on the skins for a minimum of 18 days. The wines are basket-pressed, and the resultant free-run and light pressings are combined. The wines are aged in barriques for some 15 months before bottling. The Winemaker of the Hickinbotham Clarendon Vineyard is Chris Carpenter. Chris, who is based in Napa Valley, is also the winemaker for such prestigious labels as Cardinale, Lokoya, La Jota and Mt. Brave. This entry was posted in Australia, Cabernet Sauvignon, Red Wine, Uncategorized and tagged Featured, Jackson Family, McLaren Vale. Bookmark the permalink.